The brand new Hilton Hotel at London Heathrow in Slough, just minutes from the terminal, is one of our most luxurious Heathrow hotels for terminal 5. As well as spacious rooms and just a short hop to the airport in the morning, the hotel caters to seasoned travellers who are on the lookout for a hotel that gives just that little bit extra. How about a free newspaper in the morning, and free wifi throughout? Not enough? Well, the hotel also has a florist, a news stand, a cashpoint, baggage storage, dry cleaning service, overnight laundry and safety deposit boxes. Best of all, you cant fail to be impressed by the hotel's dedication to a friendly, welcoming service. If you want to get your romantic getaway off to an early start, the Hilton hotel Heathrow at Terminal 5 takes some beating; from unique, stylish bars to the remarkable Mr Todiwalas Kitchen restaurant. If, on the other hand, youre jetting off with the family, the hotel also has good-sized family rooms, grounds to explore, a big family-friendly Gallery restaurant and neat little extras like a childrens check-in and ducks for the bath. You can even take advantage of the hotel's landscaped gardens with a stream and literally thousands of trees; not to mention plenty of wildlife, including ducks and rabbits. If you want an even more luxurious treat, for an additional fee the Imagine spa at Hilton London Heathrow terminal 5 has a huge range of treatments that could keep you occupied for days. 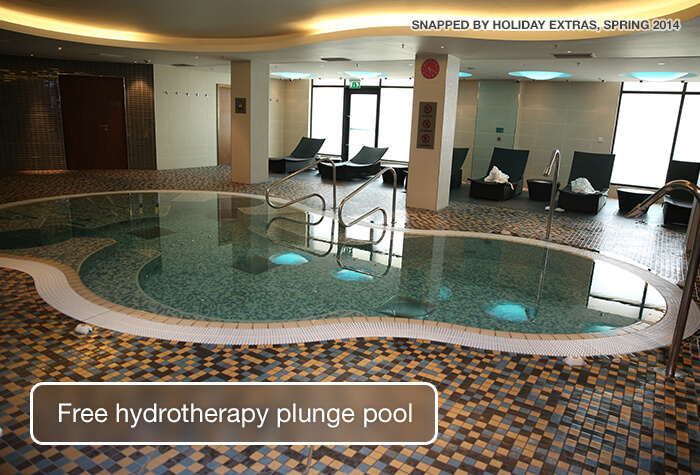 There are large hydrotherapy pools offering mini-jacuzzis, directed flow jets and whirlpools. Theres a sauna and steam room, salt-inhalation room, an ice fountain, heated beds and changing-light showers for hot or cold treatments. Treat yourself to an array of treatments in one of ten treatment rooms ranging from facials and salt peels, exfoliations or body wrap to a wide choice of massages, including hot stone, raindrop, deep tissue or scalp massage. When you're completely unwound, you can pamper yourself further with a nail bar, cooling leg and foot treatments, waxing or a make up session. While a number of the treatments at the Hilton terminal 5 spa are free, the Heathrow Hilton T5 offers a 20% discount to in-house guests for chargeable treatments from Monday to Thursday when available. Eating- Fine dining is guaranteed whether you prefer British classics in the Gallery restaurant, or the exquisite Indian food of Mr Todiwalas Kitchen. 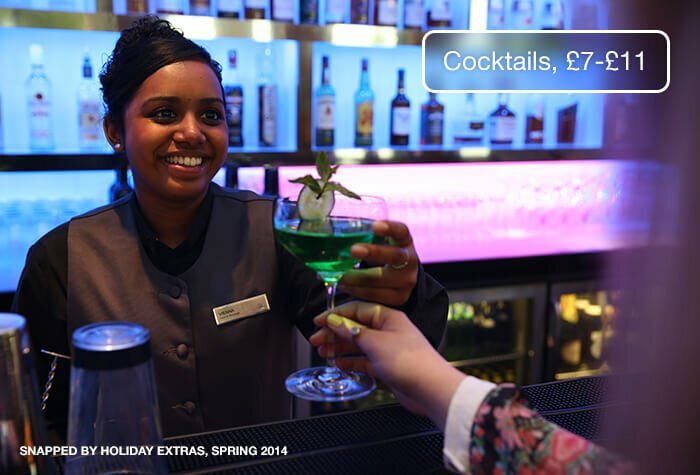 Relaxing - From the big, comfy beds to the luxury spa, the hotel has everything you need to wind down. Luxury - If you're a regular traveller, you know the benefits of a VIP service, and very few Heathrow hotels can match the Hilton. 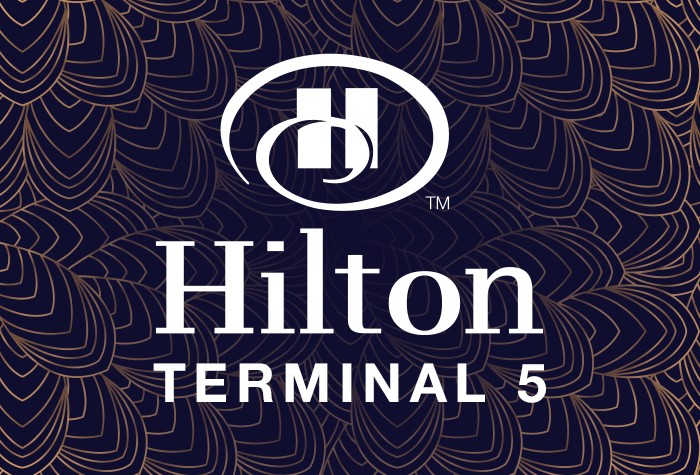 Please note if youre looking for Heathrow hotels for terminal 4 be sure to check out the Hilton Hotel T4 and if youre flying from any other Heathrow terminals, DoubleTree Hotel by Hilton might be ideal. 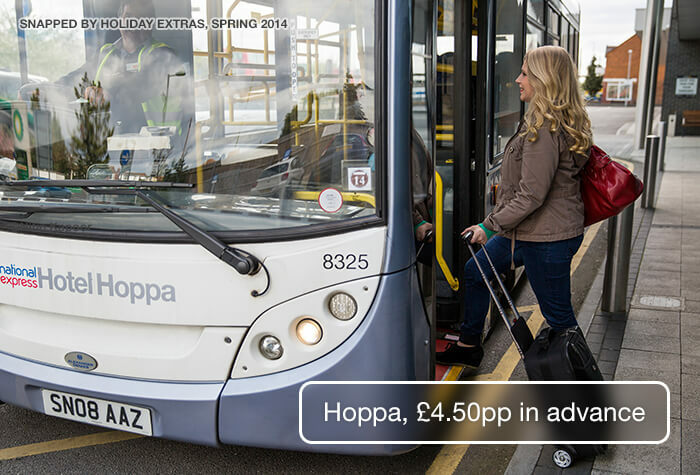 The Heathrow Hoppa shuttle bus runs regularly from the hotel to terminals 4 and 5 during the airports opening hours. The bus stops at other hotels on the way, so it can take between 15 and 30 minutes. If you're travelling to terminals 2 or 3 you'll need to get the Hoppa to terminals 4 or 5 and then use the free Heathrow Express between terminals. Alternatively, a taxi to Terminal 5 will cost around £10 and take 10 minutes in good traffic. Travelling to the hotel by train? 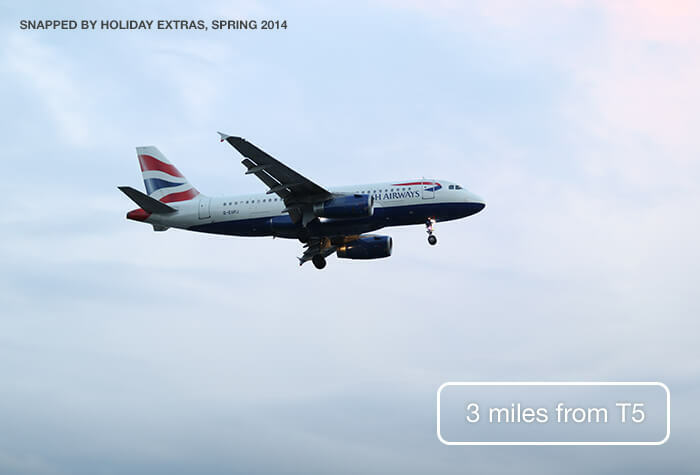 The nearest station is Heathrow Terminal 5. 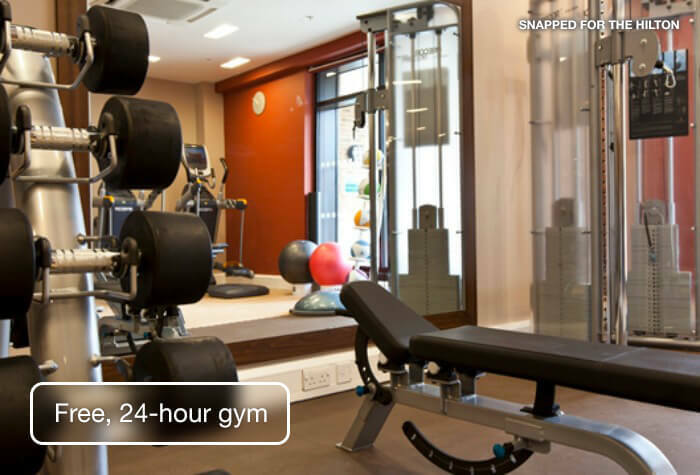 Its about 10 to 15 minutes to the hotel by shuttle bus, or a taxi will cost around £14. Overnight parking costs £16 per car. 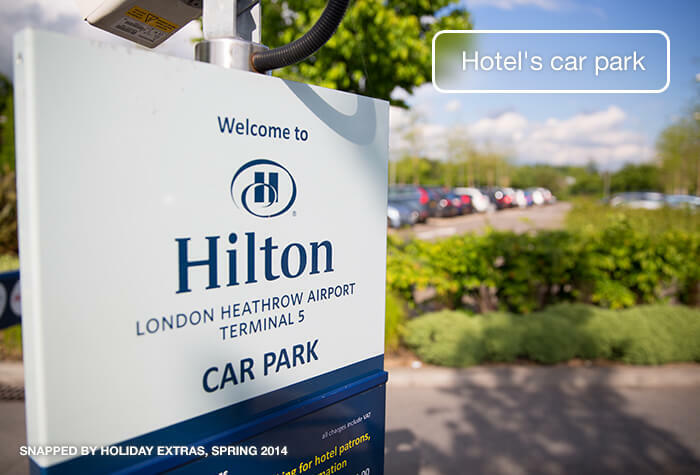 If you need airport parking for the whole of your holiday, search for airport hotels with parking. 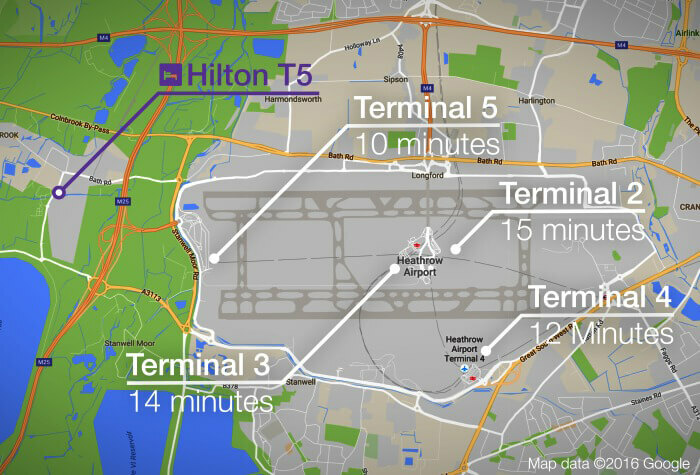 The Hilton T5 is closer to Terminal 5 than other terminals - around a 10-minute drive in good traffic. Driving directions and a postcode for satnavs will be in your email confirmation. 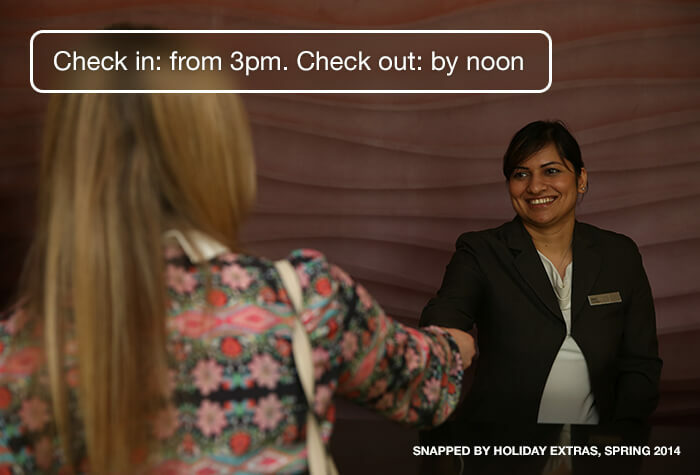 Check in: from 3pm. Check out: by 12 noon. 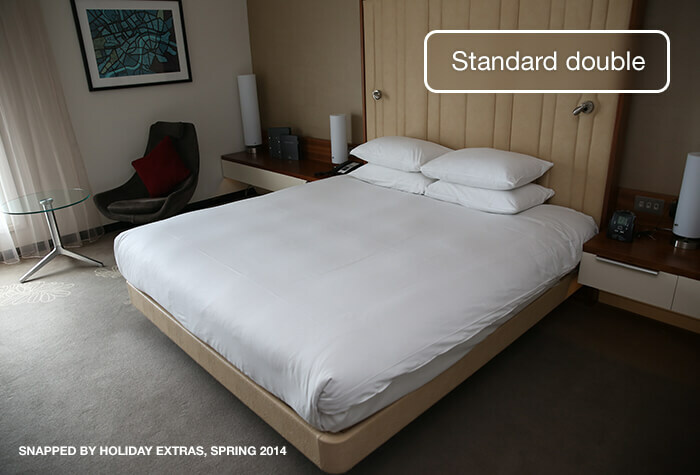 Rooms have king-sized beds, free wifi and quadruple-glazed windows for a quiet night. Newspapers are provided during the week. Guests consistently say that the rooms are clean and spacious and that the beds are firm, some rooms also offer views of Windsor Castle. Bathrooms are spacious and modern, with a deep-fill bath, a power shower, mood lighting and surround sound. Triple rooms and family rooms include a king-size bed and sofa bed. Child age 17 and under. Wifi is free throughout the hotel. Guests found it to have a strong signal and fast connection. The Hilton aims to be fully accessible, complying with the Disabilities Act of 1990. Lowered features: beds, clothes rails, light switches, peep holes, shelves, emergency evacuation instructions, and thermostat controls. The Hilton has 2 restaurants, Mr Todiwalas Kitchen and The Gallery. Food is also served in Musettis Coffee Shop and the River Bar. 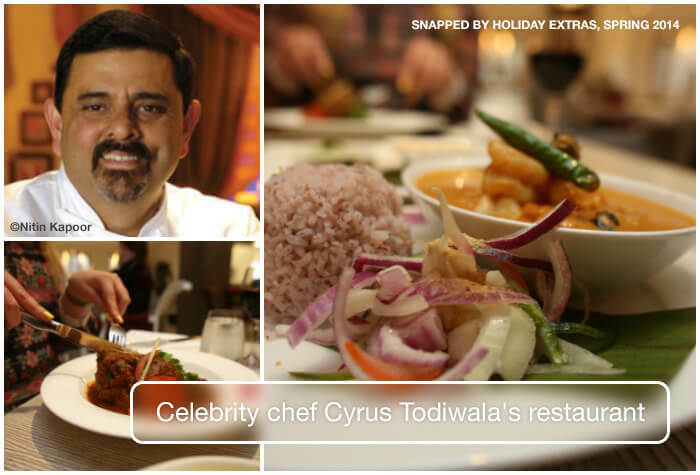 Mr Todiwalas is an Indian restaurant run by celebrity chef, Cyrus Todiwala, who has cooked on Saturday Kitchen and for the Queen at Her Diamond Jubilee. The team are knowledgeable about the menu and will be able to adapt dishes to suit your taste. Expect a room of white-washed floorboards, white walls, soft lighting and rustic-looking, wooden decor with an 8-foot wooden elephant in the centre. 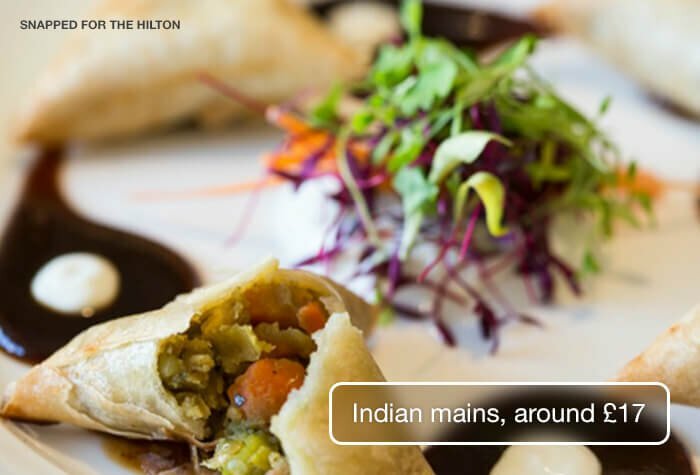 The menu changes monthly, using seasonal, British produce and authentic Indian spices. 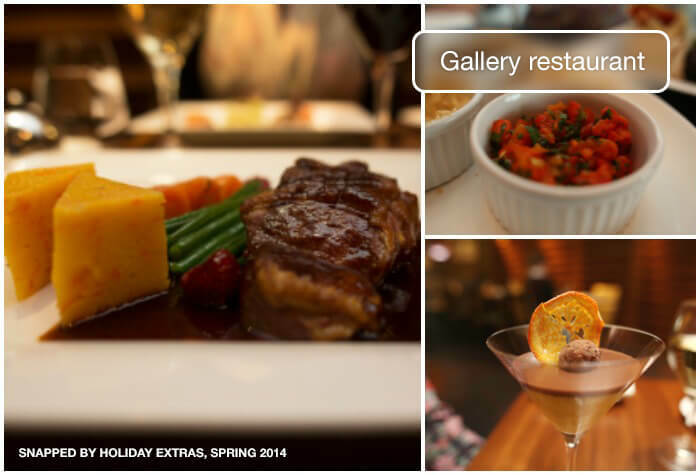 Not all of the dishes are listed on the menu - ask the team if theres something youd like. A main meal averages £17. All meat, fish and poultry are organic, free-range, or friendly-farmed from sustainable sources. This kitchen caters for vegetarian, gluten-free, nut-free and Halal dietary requirements. 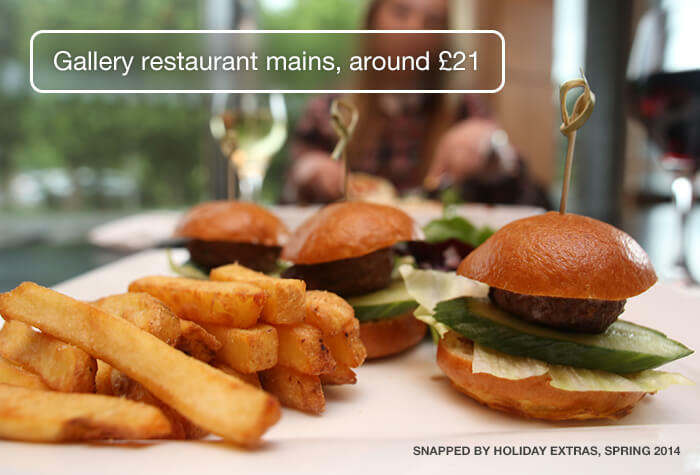 The Gallery restaurant overlooks the hotel lobby and uses local, seasonal ingredients that are traditionally British, like 28-day aged Beef from Casterbridge, Suffolk chicken and game pâté. Food is cooked to your liking and the staff can advise on dietary requests. Main meals average £21. The Gallery has a childrens menu, too. 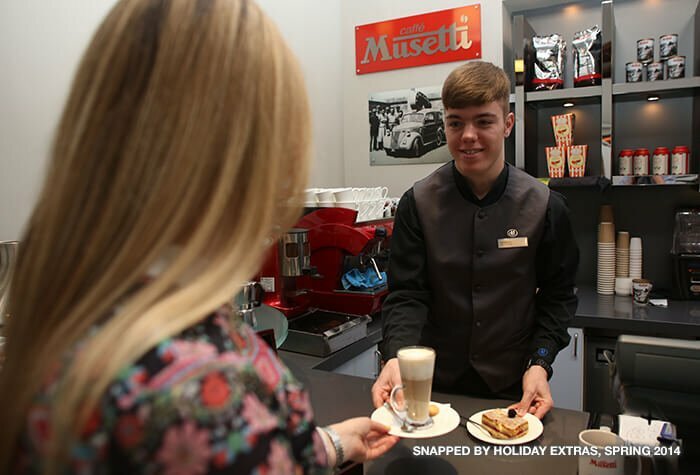 Musettis Coffee Shop serves sandwiches (averaging £12), cakes and pastries at £3.25 on average. 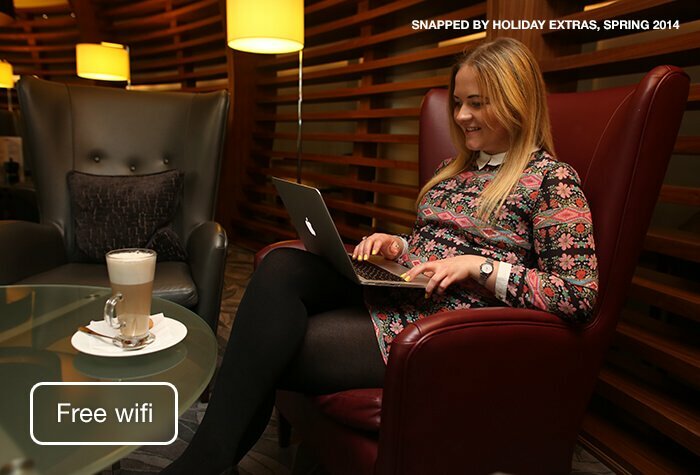 Find Musettis coffee bar and soft, leather armchairs on the ground floor of the hotel. The River Bar has a view of the River Thames, hence the name and the London theme. Expect seafood from Londons fish markets, London ale in the fish and chip batter and London honey in the salad dressing. Burgers and barbeque chicken wings come from a London meat market and the vegetables are from Covent Garden. Expect a main to average £13-£14. There are 2 bars at the Hilton; the River Bar and the Gallery Bar. The River Bar is a long, high-ceilinged room with chandeliers overhead and clean, sleek lines. A colourful light show illuminates the rows of spirits and floor-to-ceiling glass looks over the River Thames. 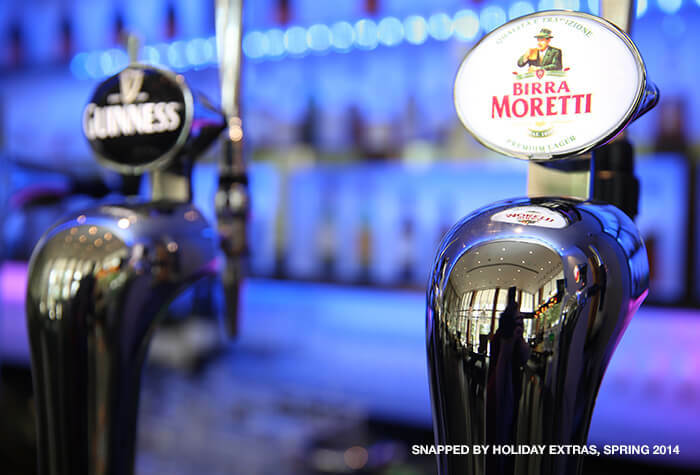 Wines, beers, spirits and soft drinks are served here. A glass of wine will range from £4.75 to £10.70. The Gallery Bar serves cocktails, non-alcoholic mocktails, wines, beers, spirits and soft drinks in a softly-lit room with muted decor. Cocktails are between £7 and £11 each. Its a continental (£16.95) and full English (£20.95) buffet for breakfast. Our guests praise the variety of food on offer and the attentive waiting staff. Save £5 per person by booking the full English buffet the night before. Theres also a breakfast menu of eggs made-to-order, an omelette station, smoked fish, fresh pancake stacks and cereals. Breakfast is served upstairs in The Gallery restaurant, where our guests praise the staffs friendliness and attention to detail. Free herb sauna, mineral grotto, steam room and hydrotherapy plunge pool. Guests must be over the age of 16. Massages and spa treatments are available at an extra cost - wed recommend booking in advance. Disabled facilities Disabled access rooms are available. These have wet rooms with accessible showers and grab rails. The hotel has lifts. Great hotel in a very convenient location for T5 - via the frequent shuttle buses. Right under the flight path but so well insulated against noise that we heard nothing in our room ! Room and facilities were excellent. Comfy bed. V Clean and tidy room. Lots of car parking - we managed to find a spot under cover at the side of the hotel. Staff were very good. Will definitely use again when needed. The Hilton Heathrow T5 staff were very welcoming, polite and helpful. This was experienced throughout our stay in all areas; reception, evening restaurant and at breakfast. Hotel room very comfortable. Our vehicle was self-parked with ease and I was able to retain my car keys. Everything was great, except the bus from the hotel did not go to the terminal we needed direct. However a member of your team resolved this for us. Hotel was great with friendly and helpful staff. This hotel will be our first consideration when flying from Heathrow. Best one yet! 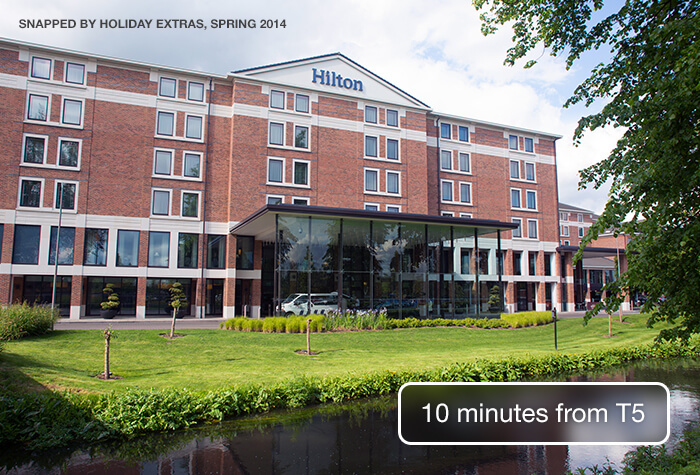 Our customers rated Hilton on average 9/10 (593 reviews). Read Hilton reviews.